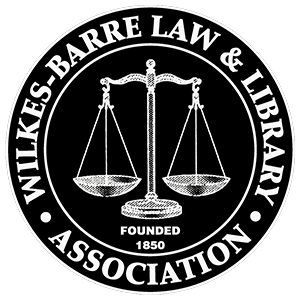 To apply for Bar Association of Luzerne County membership, telephone the W-BLLA office at (570)-822-6712 and speak to Gail, the Deputy Executive Director of Membership and Events. Your Bar Association membership entitles you to a wide variety of benefits. They include publications and programs that can help you save time and money plus help you advance your career. Luzerne Legal Register: Published every Friday, you will receive 52 publications per year which include bar news and proofs of legal notices. Discounted rates on legal ads. Lawyer Referral Service: Increase client base and income. Participation is optional. Please call (570)822-6712 for more information. Continuing Legal Education (CLE) Discount: Discounted and some free admissions to various CLE’s throughout the year. Bar Association Events: Attend events such as Quarterly and Annual Lunch Meetings, the Annual Law Day Dinner Dance, Summer Outing, Bench Bar Conference, etc. at a special member rate. Young Lawyers Division: The YLD hosts fun social events and organizes projects of benefit to the association and the community. This group provides an excellent, informal means to network with new lawyers. Participation in the YLD results in discounted costs for all bar events and CLE’s. Committee Activity: Participate in W-BLLA through any of the more than 30 committees covering a wide range of interests and expertise.